The United States spends more, both per capita and as a percent of GDP, on healthcare than any other country, yet fails to achieve commensurate health outcomes. 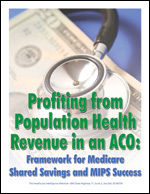 One reason for this discrepancy between health spending and outcomes is the significant amount—upwards of $200 billion per year—that the United States spends on low-value care, according to the University of Michigan Value-Based Insurance Design (V-BID) Center. 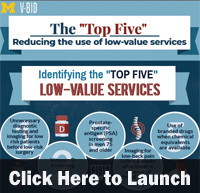 A new infographic by the V-BID Center provides a list of the top five low-value clinical services for purchasers to target for reduction. The selected services were chosen based on their association with harm, their cost, their prevalence, and the availability of concrete methods to reduce their use.